Press play on City543 this month as we talk music, our constant companion. From places to buy, listen and dance to music, we wanna – in the immortal words of the King of Pop – rock with you, all night, dance you into day. Other than wholesome mountain trails, delicious food, extravagant night clubs, Taiwan is actually also an amazing hub for the live music scene, whether for international artist or local underground musicians. From open mic nights, live jazz lounges to cozy cafe acoustic sessions, Taipei offers great spots for every kind of listener to get their live music fix. Perhaps the most well known and established live jazz destination in Taipei, Brown Sugar is a fancy spot in the middle of the concentrated nightlife district in Xinyi. The bar includes talented touring jazz singers and sporadic special guest musicians. The more upscale venue is staffed with kind personnel who provide excellent service and pretty nice cocktails at affordable prices well worth the entertainment. It’s a great place to relax and listen to live jazz while sipping on a classy martini. One more thing – the singers usually take requests! The local musician’s favorite, this little underground jazz bar is tucked away in a soundproof basement of in an inconspicuous residential area. Although it’s easy to walk right past it without noticing, this spot is the regular gathering for many of the city’s best jazz talents. The open mic nights on Tuesdays attract the local undiscovered talent, both old souls and fresh blood, to spontaneously collaborate, exploring genres beyond just the typical jazz standards. A bit further from both the entertainment area of Xinyi and the campus district, Bobwundaye is a divey music restobar feeding more to the local expat crowd. The small and cozy spot is decked with graffiti, featuring a stage-less music ambiance for a truly intimate live experience. It’s also known for its reasonable prices and large diversity of beers and spirits, making it a regular favorite for expats. Bobwundaye has open mic nights every Wednesday, for a more pop/rock musical exploration. The Wall is the go-to live spot for the musical hipsters in Taipei, for its frequency of gigs at five shows a week and affordable drink prices feeding to the surrounding student population. Over the years, The Wall has been the premiering spot for many internationally-renowned indie bands touring Asia. Gearing more toward heavy metal, punk rock, EDM and more, the venue upholds its reputation for one of Taipei’s best venues for all kinds of music lovers. If you’ve ever hung out with music nerds, you’d know that sometimes the best place to hear live music is the very living room of someone’s house. Cafe V is a great destination for the close-knit homey-feel for live music, accompanied by great German cuisine. With patterned wallpaper, vintage rugs and shaded lamps, the place will make you feel right at home while you soak in some local talent. 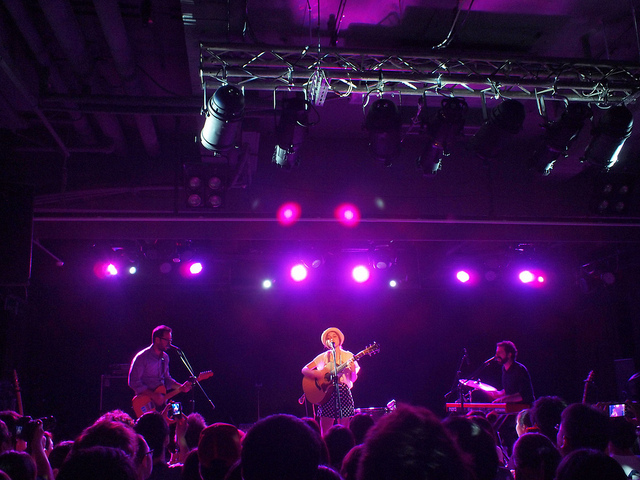 Legacy has hosted artists from international stars like St. Vincent, Priscilla Ahn and James Blake to Taiwanese favorites like Khalil Fong (方大同), A-Lin and Lara Veronin (梁心頤). With its smaller space and closer proximity to the audience, Legacy allows a more intimate and affordable live music experience than the typical extravagant venues like the Taipei International Convention Center or the Nangang Exhibition Hall. Located in the middle of the Huashan Cultural Park, it’s a perfect spot to hit up for a night of live music followed by a romantic drink at the surrounding local favorites like Trio or Alley Cat. Located in the vibrant and eccentric Ximen District, Riverside Live House is an intimate music venue frequented by many of the once-undiscovered talents in Taipei looking for exposure. Residing in the beautiful and historic Red House, the spot was one of the first to bring underground music into the vibrant populated streets at the center of Taipei. For a smaller, music cafe vibe by the same creators, be sure to also check out the Riverside Music Cafe near the campus hub off of the Gongguan MRT station. For a live music cafe-vibe that is a little bit larger in scale, check out the Kafka by the Sea cafe and restaurant right beside the aforementioned Riverside Music Cafe in the middle of the lively campus district of Taipei. This is a spot to hit up for lovers of acoustic music, frequented by both underground artists and established musicians wanting to explore a more stripped-down sound.